When after a long travel an exhausted caravan was approaching Samarkand, experienced caravan men knew that whichever destination they were heading for, they had covered half of the route. For Samarkand, since olden days, marked the halfway break located in the centre of the crossroads of caravan routes, forming the Great Silk Road. This legendary network of routes connected broad overland expanse from China to the Mediterranean. It is probably the only international highway of more than ten thousand kilometers in length that crossed the countries of two continents. All branches of the Great Silk Road, which led to Eastern Turkestan and China, India and South Caucasus, Iran and Byzantium and further to Europe, intersected in Central Asia, on the territory of modern Uzbekistan. Here more than two thousand years ago there flourished the ancient states, such as Sogdiana, Bactria, Khoresm, which later made up the nucleus of Parthian and Graeco-Bactrian kingdoms. On this land at the beginning of the new era there appeared a powerful Empire of Kushans. Silk, which gave name to this highway, was an important but not the only article of trade on caravan routes. Bactrian camels, strong and tireless animals that often helped the traders to survive in waterless deserts and desolate plains, were used for conveyance of different goods: precious stones and gold, carpets and leather, porcelain and lacquered articles, glassware and weapons, and many other articles. In the first centuries A.D. the caravans that made their way from Ferghana oasis to China brought herds of horses which were highly appreciated in China. From Central Asia to the East and the West alike, the merchants brought seeds of the valuable plants: alfalfa, peach, and melon. A brisk flow of goods along the Great Silk Road was much through the Sogdians who founded trading stations along the main routes from Samarkand to Turphan. Sogdian traders traveled to Iran and Byzantium. Stopping places that emerged at the crossroads of busy caravan routes more than two thousand years ago gave rise to the largest cities such as Tashkent, Samarkand, Bukhara, Khiva, Termez and Shakhrisabz. Here the nations mixed up; whole empires rose and fell, religious and philosophical doctrines from Zoroastrianism and Buddhism to Islam emerged and were propagated. The cities located along the Great Silk Road abound not only in their monuments of antiquity, but also eventful, at times glorious, sometimes tragic, history. They witnessed the campaigns of Alexander the Great, Arabic conquest, invasion of Genghis Khan. They also saw the rule of Ulugbek, the great scientist of the East. Traders and warriors, pilgrims and missioners not only introduced their culture to the peoples of Central Asia but also took over many customs of local people. Centuries-old culture of Central Asia is a conglomerate of traditions of the ancient Sogdians, the Bactrians, the Khoresmians and other nations whose culture contained the elements of both western, Hellenic, and eastern civilizations. 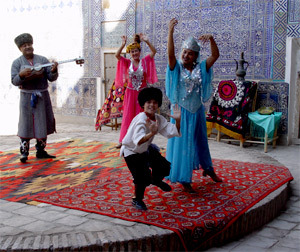 It is no coincidence that historical centers of Samarkand, Bukhara and Shakhrisabz as well as the complex of Ichan Kala in Khiva are included in the 'World Heritage' list of UNESCO. 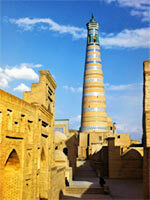 Samarkand is known to be the centre and main junction on the Silk Road. It was here in Samarkand that the World Tourism Organization (WTO) set up its office on development of tourism on the Great Silk Road. It is worth saying that Samarkand became the second city in the world where the WTO office was opened (the first office is located in Osaka, Japan). The WTO, so to say, opened here its gates on the Great Silk Road. 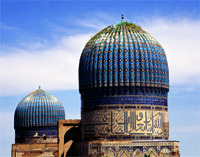 Thus this international organisation has emphasized the importance of Samarkand as the main tourist centre on the Silk Road. The peak of urban planning in Samarkand can be pertained to the times of Amir Temur who in 1370 made the city the capital of his empire. The great conqueror brought from his military campaigns skilled architects, builders, craftsmen who, together with the local masters, erected wonderful palaces, mosques, madrassahs. 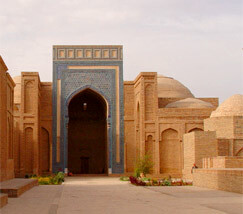 The construction works in Samarkand were continued under descendants of Amir Temur, the Temurids, who worked up the architectural lay-out of the city. The grand mosque Bibi Hanim, Gur Emir mausoleum with the burial vault of Amir Temur, legendary Registan square and Shakhi-Zinda necropolis built during the lifetime of several generations can be rightly called the masterpieces of Central Asian architecture. In the Middle Ages Holy Bukhara became the hearth of learning; more than one hundred maddrassahs functioned here at that period of time. It was the city where Abu Ali ibn Sino (Avicenna) started his practice. The name of the city is closely associated with such notable names as poet Rudaki, historian Narshakhi. There are more than one hundred and forty architectural monuments in Bukhara, and among them the real gem is Ismail Samani mausoleum erected at the beginning of the 10th century. The Ark citadel, once being a residence of emirs of Bukhara, and the well-known Kalyan minaret tower the city as sentinels keeping the city's glorious past. City-museum Khiva is one of the few cities of the world, where built-up area of the 17th-19th centuries has preserved almost intact. Ichan Kala, the core of the city, today opens to the travelers its ancient gates through which in the old times caravans carried silk. Tash Khauli, the Palace of Khan, with its harem premises and a vast courtyard, cathedral Friday Mosque, colossal skeleton of unfinished minaret Kalta-Minor make the city look like an animated oriental tale. 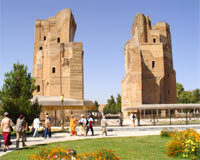 Shakhrisabz is mainly known as the city where in 1336 Amir Temur was born. Here he grew up, here his father, Amir Taragai, was buried . Building up his huge empire with the capital in Samarkand, the Great Conqueror never forgot and constantly cared for his minor motherland. Ak Saray palace, which was built by his orders, captivates the visitors by the monumentality of its proportions and splendour of its decor. The city's other attractions are Dorus Saodat and Dorus Tilavat architectural ensembles, including the memorable mausoleum of Temur's spiritual advisor sheikh Shamsutdin Kulol. Branches of the Great Silk Road went through Tashkent, Termez,Ferghana, Kokand and other cities of Uzbekistan. Tashkent was one of junction points on caravan routes. Records of Tashkent can be found in 'Avesta' and in old Chinese chronicles. No city of Uzbekistan seems to be explored as thoroughly as Tashkent, which numbers about two hundred and forty archeological monuments. In the old, historical, part of the city there are located such prominent monuments of medieval architecture as Kukeldash madrassah, Kaffal Shashi cemetery, complex of Barak Khan. 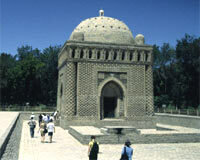 Termez, one of the most ancient cities of Uzbekistan, in the Middle ages was the largest centre of Toharistan. Numerous architectural monuments, which have preserved to the present day on the territory of Old Termez and its suburbs, testify to the bygone grandeur of the city. Among the main attractions of Termez there are two constructions which are highly respected in the whole Moslem world: these are the burial vault of Hakim-at-Termezi, spiritual patron of the city, and mausoleum of the legendary prophet Zul-Kifl on Paigambar reserve-island. The real sensation in scientific world was the discovery in Old Termez of ruins of Buddhist temples and monasteries of Dalverzintepa, Fayaztepa, Karatepa, constructed in the 1st and 2nd centuries during the reign of Kushan dynasty. More than four thousand historical and architectural monuments, somehow or other connected with the history of the Great Silk Road, can be found on the vast area from the oases of Ferghana Valley to the deserted coast of the Aral Sea. They testify to centuries-old traditions and high spiritual culture of the peoples who have populated Uzbekistan since ancient times.